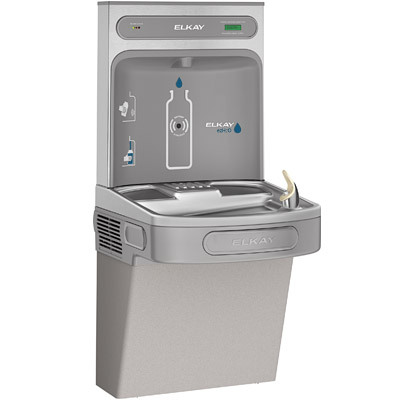 The Elkay LZS8WSLK EZH2O Bottle Filling Station provides 8.0 gph of 50° F water at 90° F ambient and 80° F inlet water and includes an electronic sensor for no-touch activation with an automatic 30-second shut-off timer. The Elkay LZS8WSLK provides 1.1-1.5* gpm flow rate with laminar flow to minimize splashing with antimicrobial protected plastic components to prevent mold and mildew. The Elkay LZS8WSLK has push-bar activation and water-efficient Stream-Saver™ bubbler. The Elkay LZS8WSLK includes the WaterSentry® Plus filter, certified to NSF/ANSI 42 and 53 for lead reduction, with visual monitor to indicate when replacement is necessary. The Elkay LZS8WSLK meets ADA guidelines for frontal or parallel approach and has lead free design which meets Safe Drinking Water Act and is certified to NSF/ANSI 61 and California AB1953. The Elkay LZS8WSLK is certified to UL399 and CAN/CSA 22.2 No. 120. Complete filtered cooler and bottle filling station in a consolidated space saving ADA-compliant design. WaterSentry® Plus 3000 gallon filter included. Elkay recommends that you replace this filter annually. Sanitary, no-touch, sensor activation with automatic 20-second shut-off timer. Quick fill rate is 1.1 gpm for refrigerated units and 1.5gpm for non-refrigerated units. Filter Monitor indicating when replacement is necessary. Green Ticker™ counting the quantity of bottles saved from the landfill.